Stallion Motors Limited, assembler of Changan automobiles in Nigeria has said its facility in Lagos has been intensified to produce competitively priced entry level CS35 sport utility vehicle (SUV). CS35 is poised to inspire additional patrons just as it moves to position the vehicle as the most preferred compact SUV. In a statement made available to The Guardian, the CS35, is expected to halt the spontaneous tidal movement from C-segment sedans to B-segment cars just as it promises to offer sustainable preference for discerning customers looking for affordably priced entry-level sport utility vehicle. The CS35 compact SUV demonstrates aptitude and versatility of an urban-styled crossover with strong stance, smooth-styling-details that predates the automaker’s 32 years’ experience in building and selling passenger vehicles in its 156 years’ industrial history. As in most advanced climes, the Changan CS35 is already relishing attractions amongst discerning auto buffs in Nigeria and it promises to be competitively priced to enable more patrons have access to the vehicle. Currently ranked number one among Chinese automobile brands with yearly sales volume of three million units, no fewer than 8,500 new Changan vehicles are sold daily in 6,000 sales and service facilities in more than 60 countries. Changan is undoubtedly, a tech-savvy automotive giant with extensive investment in advanced research and innovative technologies, a commitment that has reinforced its partnership with global research and development (R&D) organisations. The CS35 according to Changan was borne out of the automaker’s desire for advanced research and innovative technologies through the formation of global R&D partnership agreements with renowned European, American and Japanese automakers. Built with superbly striking features including six-way manual adjustable driver seat, four-way co-driver seat and eye-catching attractions such as front/rear fog lamps, shark-fin antenna, leather seats, multi-functional steering wheel, rear parking sensors, ABS/EBD with brake assist among others, the CS35 is yet unmatched by archrivals in the small SUV segment. “Changan applies new technologies to provide hi-tech, high quality and fashionable automobile products for the customers and this is why the ‘V’ logo, which epitomizes ‘Victory’ and ‘Value’, is committed to building world class automobile enterprise and creating value for customers,” the automaker declared. The Changan CS35 also won sequence of international design honours especially for styling and cutting edge environmentally-friendly design concepts. In 2015 for instance, Changan won the National Science and Technology Progress award, reaffirming Changan’s commitment to the advancement of technology and innovation through R&D. The company’s R&D capability was ranked first in the Chinese automobile industry for eight years, benchmarking world’s leading companies with high standard laboratories, averaging 16 fields. Italian Chief Designer Dambrosio Luciano, who designed the CS35 attributed the uniqueness its design and exceptional value additions such as the interior package-type capsule design that centers on the driver, with ultra-quiet cabin as well as rich molding levels. According to him, the CS35 was intentionally styled to outclass rival marques in capability and value addition coupled with several other attractive features such as front dual-SRS airbags and anti-theft alarm; six-speaker audio system, front reading lights, front and rear headrest, power windows, remote key control among others. Other eye-catching features include front/rear fog lamps, strong and elegant black/silver multifunctional luggage rack, sunroof, leather seats, rear parking sensors, front dual-SRS airbags and anti-theft alarm etc. The body is made of high strength steel with four-wheel disc brake system equipped with Bosch’s ninth ABS and BAS Braking Assist Devise as well as energy absorbing steering column. Under the hood is a new generation Bluecore efficient H-series 1.6L powerful and fuel efficient engine mated to a brand new Japan made five-speed manual transmission and SsII four-speed automatic transmission incorporating state-of-the-art technologies such as DVVT, DOHC, low friction, light weighted and STT. The combination of these technologies enhances fuel economy, nimble acceleration and produces lower Co2 emission. The CS35 is adjudged excellent for good ground clearance (180mm), and reliable driving etiquette. 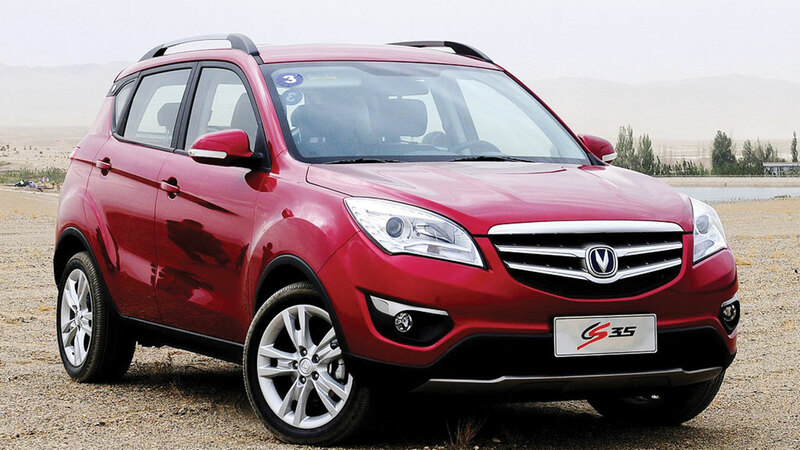 Beyond comfort; the Changan CS35 is rated five-star, having met domestic first class safety level and requirements of European Collision Regulations and American Standard on complete vehicles, occupant and roller protection. This model also offers cutting-edge safety protection such as TRN Brake System, four airbags, speed sensitive wipers, energy absorbing steering column, pretention and ventilated four-wheel disc brakes. The CS35 is equipped with 215/50/R17 tyres, cruise control, CD/USB/AUX and retractable side mirrors. Renowned test drivers disclosed that the CS35 crossover is a driver’s delight with lots of premium sensation comparable to racing cars with properly seamed seats, using red threads.